While the initial reveal of Twins 2: Now There Is A Black Guy Also was uncomfortably close to April Fools' Day, and seemingly calculated to upend the tradition of the faux-news story prank with even more ludicrous reality, it turns out the project has actually been in development for a while, insofar as saying there should also be a black guy this time counts as “development.” Coming Soon has published an excerpt from an interview conducted with Arnold Schwarzenegger late last year, in which the newly unretired actor confirmed that he was already in discussion on Triplets, then laid out his entire blueprint for creating laughter: “I’d find somebody like Eddie Murphy or someone that people would say, 'How does that happen, medically speaking?' and, 'Physically, there’s no way! '” Schwarzenegger said, his voice no doubt rising at least two registers to convey the comedic incredulity of hypothetical audience members who—upon hearing that not only are a knotty Austrian oak and an Italian troll-bear unlikely brothers, but also so is a fast-talking black man—will find themselves gobsmacked by the medical improbability of it all, standing there dazed on the sidewalk and petitioning Mother Nature to answer for her caprice. 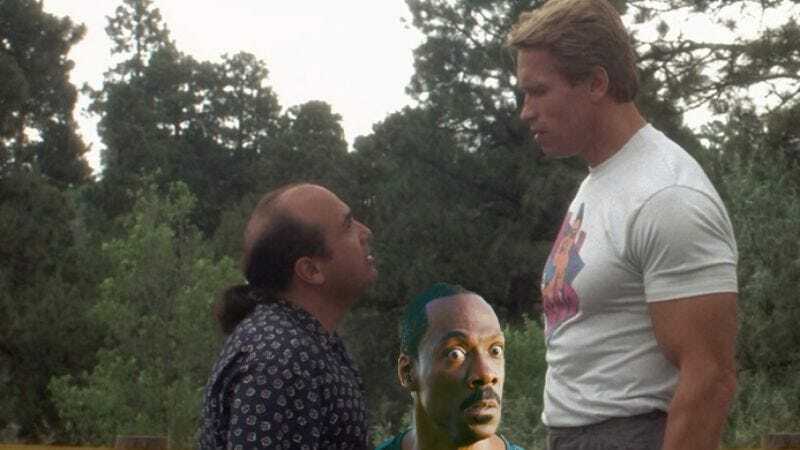 But don’t worry: “Then, somehow, we would explain it,” Schwarzenegger assures, adding, “That would be hilarious with what we know about someone like him," in reference to the incongruity that he is black and Eddie Murphy-like and the others are not. Having thus boiled down Triplets to its most salient comedic notes, leaving it so the screenwriters will only have to fill in the blanks, Schwarzenegger moved on to doing the Universal marketing team’s job for them: “I can see a poster," he said. "A billboard with us three. 'They found another one!' Triplets! 'Only their mother can tell them apart! '”—which will also be funny, because clearly other people will be able to tell them apart, because look at them. Schwarzenegger then concluded by offering the most astute assessment of the film’s genesis and, by proxy, the state of the entire modern movie industry: “ I would do that in two seconds, because that’s real entertainment,” he said. “You come out with that movie for Christmas, like December 5th or something like that, and you’re home free." Indeed, rehashing a nostalgia property by simply doubling down on its one-joke premise, then releasing it during a season when audiences held hostage by their own holiday torpor will go see it out of the need for pure numbing escape—that is real entertainment under its current definition. Also, it would have a black guy now.